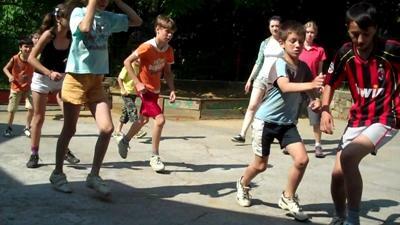 Projects Abroad offers opportunities to volunteer as a sports coach in Europe. As a volunteer, you can get involved in coaching sports like soccer, basketball, and general physical education in schools. Volunteer sports coaches can have a significant impact on children and teenagers by encouraging then to be enthusiastic about sports and fitness and increasing their general health and fitness. Getting involved in sports coaching also gives you the chance to help your students develop their confidence and team skills. How Can I Coach Sports in Europe? Volunteers coaching sports in Europe with Projects Abroad are of all ages, ranging from students on a gap year or summer break, to people on a career break or in their retirement. You do not need any previous coaching experience to join, only a general love of sports and a desire to learn. Volunteer as a football coach in Brasov, Romania and help children and young adults aged 8-15 develop their skills in the sport. Volunteer at a local elementary school in Romania and teach children a variety of sports, such as soccer, volleyball, and track & field.